With high quality images played on screen sizes of your choice, LCD/Plasma screens are definitely the way forward. LCD/Plasma screens can serve multiple purposes: they can play music videos, personalised graphics, DVD's, slideshows and are even compatible for live video link up. 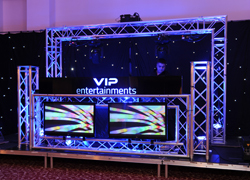 These facilities are all part and parcel in bringing that touch of class to your event. Those with big events can place screens all around your venue so all guests can view important ceremonies, those that have drinks receptions make use of LCD/Plasma screens to keep guests entertained whilst they mingle. Projection screens can be a great way to showcase family photographs, visual effects, music video or a live feed from the videographer on a large screen. Projection screens vary in sizes, an effective way of keeping your guests visually connected so they don't miss a moment of your special day in the comfort of their own seat such as cake cutting ceremony and first dance due the size and clarity of the screens. 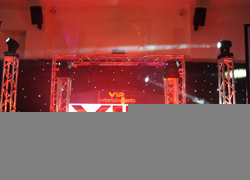 Taking entertainment to the next level, VIP Entertainments introduce the ultimate product for your function. 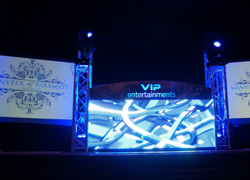 The Led vision backdrop is a must have for any event, it embraces leading market technology with outstanding results. 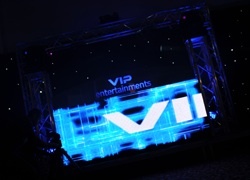 VIP Entertainments are now able to setup a life size (pixilated) vision cloth that is capable of inputting text, making life size patterns/effects and even play video files. The LED vision cloth is the brand new product that has left the music industry shaken with admiration. Go that extra mile and make your function as exclusive as it can be. A spectacular addition to an event is our LED Wall. This wall is computer controlled to show an amazing array of patterns and lights as well as scrolling messages and wording across it. Great for exhibitions stands too, enabling you to add a personal touch to the event and really make a memorable impression.